A radio sales rep asked me the other day to blog about measuring the effectiveness of radio advertising campaigns. Did I know of any great ways? Of course, there are a number of ways it can be done, some fairly involved. But here’s a simple one that works: tie your radio commercials to your website; then use GoogleMetrics to monitor your web hits. Reliance Home Comfort’s office in Barrie, north of Toronto, is known as “Reliance Yanch”. They took this approach in the fall of 2012 and here’s what happened. Before the campaign was launched, no radio or TV advertising was being done. No other media were used during that time so they could get a true reading on the radio campaign’s effectiveness. The radio commercials began October 21 and ran five consecutive weeks. Look closely at these metrics from Google that corresponded to the radio campaign. 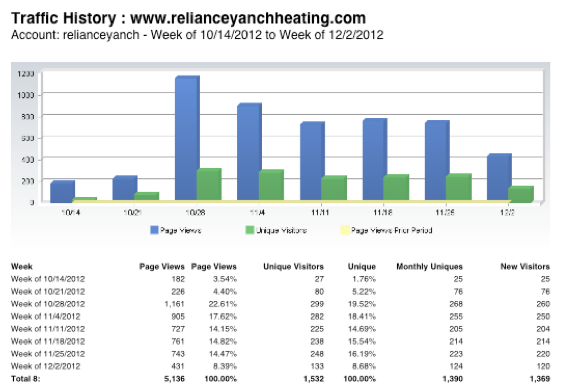 In the two weeks before the commercials ran, the website was averaging 54 unique visitors per week. During the campaign, that shot up to average 258 visitors. That’s about 5 times as many new prospects on their website! Even the week after the radio commercials stopped airing, the metrics show they were still getting three times the visitors than in the weeks before the radio campaign began. This ‘value-added’ benefit illustrates the superior longevity of the “emotional memory” radio campaigns can produce, especially when using a jingle. Bottom line… did this 500% increase in web visits result in more revenue? Within one year, the Barrie branch went from being the lowest performing branch of all Reliance offices, to being one of the top three branches across Canada! – keep an eye on your growing revenue!